Christmas in East Texas is scented by pine woods and coffee, and bright lights appear in town squares and oil fields to illuminate memories of eras long past. Aaron Reed takes a couple of holiday road trips -- one to Marshall, the other to Kilgore -- to discover the spirit of the season. 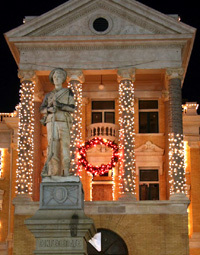 The Harrison County Courthouse in Marshall, Texas is one of the centerpieces of a 10-million light extravaganza in the city. Broad thoroughfares approach the courthouse and Whetstone Square from each of the cardinal directions in Marshall, Texas. For more than a month -- until New Year's -- the city hosts a "Wonderland of Lights." Even interstate highways appear bucolic as they roll through the east Texas pines. 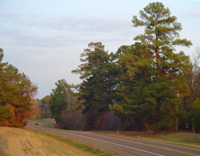 Native pines tower over a country road near Longview, Texas. Flying in the face of stereotypes, the eastern portion of the state is covered by the western-most extension of the great Southern Pine Forest. A memorial to Confederate soldiers stands in front of the Harrison County Courthouse in Marshall, Texas. The city was an important trade and government center for the breakaway nation, and for a time hosted Missouri's Confederate state government-in-exile. A replica of the Alamo picked out in lights -- along with some out-of-place saguaro cactuses -- stands on a Marshall street corner. Christmas lights and an old movie house marquee light the deserted streets of Kilgore on a cold and damp winter night. 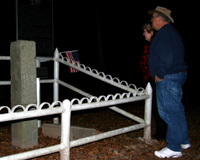 As night falls, my parents, Bob and Judy Reed, ponder the text at the only known international boundary marker within the United States. The 1841 marker, which once marked the western edge of the United States, now stands on the Texas-Louisiana state line. It's always a risk, planning a road trip for the aftermath of a holiday repast. Will I really feel like rolling out the door and down the highway? Can I be budged from my cozy nest in front of the fire at my parents' home in Longview, Texas? Those were a few of the questions rattling around in my brain in the wake of the first big family gathering of the holiday season. As Mom and Dad shrugged into coats, I cast a desultory eye about for my shoes. Tamara sat on the edge of her chair, waiting to see which way the decision would go. "How far to Marshall?" I asked my dad, again. "Oh, it's just down the road," he said. "Less than 30 minutes." Of course, my dad makes that claim about most of the places he drags us off to these days. Since returning to the East Texas Pineywoods after a four-decade hiatus, he believes he's in the center of the known universe. In his view, we should be pleased to go exploring at a moment's notice. It's easy to see why he feels this way. East Texas is a world nearly complete in itself. The region boasts a scattering of "right-sized" cities - burgs with populations ranging from 25,000 to about four times that number - most with well-developed ring roads. In between, charming towns dot the rolling, tree-covered hills. Tamara and I have traveled five hours slantwise across a third of the state from Austin to get here. Might as well take in the sights. Convinced, I tie my shoes and duck through the cold rain to Mom's trusty Ford Focus. A quick trip east on Interstate Highway 20 brings us to venerable U.S. Highway 59 on the outskirts of Marshall. This one-time capital of Missouri's Confederate government-in-exile was an important trade center during the War Between the States; ironically, it later became a center for Black education and a center of the civil rights struggle of the 1960s. Today, it is a small city that has both charm and bustle. As we drive into Whetstone Square, the old Harrison County Courthouse looms ahead, etched in sparkling, austere brilliance. Volunteers from the Chamber of Commerce ask us for a $5 donation and issue a windshield sticker. "It's good for the whole season," drawls an older gentlemen from beneath layers of flannel and down. "Come back and bring your friends!" We're here for the estimated 10 million lights on display in Marshall's holiday "Wonderland of Lights," an annual tradition since 1987; it is part of the "Trail of Lights," a tri-state circuit that also includes displays in Jefferson and Kilgore, Texas, as well as in Natchitoches, Shreveport and Bossier City, Louisiana. Marshall's display illuminates public spaces, businesses and private homes in lighted scenes ranging from the whimsical to the religious. It is reportedly one of the largest holiday light displays in the nation. We leave the tour map provided by the Chamber of Commerce in the car and join the promenade of tightly bundled families walking the square. One turn and a few photos, and it's time to duck into R&R Bakery for a hot cup of coffee. The bakery, in a historic building at 115 E. Houston St., would have been inviting for the golden light spilling from its windows alone. After fortifying ourselves and lounging on the plush couches near the coffee bar for a while, we climb back into the car and follow our map through the driving tour of the rest of downtown Marshall, which includes the historic, antebellum Starr Family Home and the old Ginocchio Hotel near the Texas & Pacific Railroad Depot. My favorite: an outline of the Alamo fronted by a field of saguaro cactuses and the words "God Bless Texas." Marshall's Wonderland of Lights celebration runs from the weekend before Thanksgiving until New Year's Eve each year. The next day brings with it the promise of more lights after the sun goes down, but first we're off to see a landmark that has achieved near-mythic status in my mind over the past few years. My father came across it on one of his pipeline surveys: a granite pillar marking the boundary between the United States and the Republic of Texas. 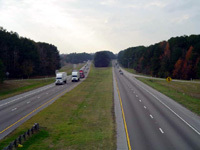 We once again take Interstate Highway 20 east toward the Louisiana border (Shreveport is less than an hour that direction, Dallas only about two hours the other way), but this time we exit south on Farm-to-Market Road 31. The route takes us through the farming and ranching hamlets of Crossroads, Elysian Fields, De Berry and Deadwood. Ten miles after passing through Deadwood, we reach the state line and pull off into a parking area on the north side of the highway. There, surrounded by a steel pipe fence, is a nondescript, square, gray marker with "U.S." cut into one side and "R.T." (Republic of Texas) in the other. Not much to look at, really, but the monument, placed in 1841, is evocative of a great sweep of American history. It is, in fact, the only international border marker known to exist within the boundaries of the current United States. From the border, we retrace our route back to Longview, and then head south on U.S. Highway 31 (a lovely four-lane through towering pine trees) to Kilgore. Dad's office is in Kilgore, and he promises a "different" sort of holiday light display there. We park in the middle of the "world's richest acre," ground zero for the 1930s East Texas oil boom. The derricks that quintupled Kilgore's population 70 years ago now stand as memorials. Sure, they still pump oil here, but not at the frenetic pace of years past; not in the chaotic, freewheeling way that required more than one visit by the Texas Rangers. During the holiday season, the looming, skeletal structures are topped with huge -- and bright - Texas stars. The chilly weather has not relented, and once again we seek refuge in a coffee shop. Kilgore is a quiet town and home to just 12,000 people, so it was a pleasant surprise to find, on the town's main street, GoodDay Coffee+Books at 111 E. Kilgore St. Bright and welcoming, the coffee shop offers free Wi-Fi and more than 3,000 titles, many drawn from among the best-seller lists of some of the nation's most venerable independent booksellers. The shelves inside the café comprise something of a modern "Great Books" list; someone chose carefully, and well. GoodDay is emblematic of what may be another trend -- urbanites returning to a simpler and slower way of life. Shop owner Brent Brown is a partner in a successful architectural firm in Dallas, and his wife, Anne, is a vice president of the National Audubon Society. R&R Bakery in Marshall also is owned by urban expats: a former Californian and a one-time cancer researcher from the University of Texas-Tyler. Even on these two damp and chilly winter nights, it is easy to see what they may have found here: a slower pace, gorgeous scenery and historic buildings awaiting new lives. Later, in the spring, maybe we'll come back for the blooming dogwood and grape-scented wisteria and a steamboat ride on Caddo Lake. In Jefferson, we can browse the antique stores, or maybe we'll head on up to Canton for "Trade Days," the citywide flea market held there the first Monday of each month. My Dad's not far wrong: It's pretty much all right here, hidden away in the pines.